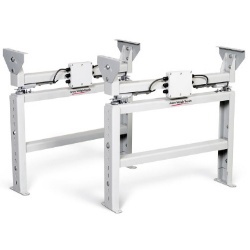 Avery Weigh-Tronix Weigh Leg frames are weighing elements that can create a scale out of any conveyor section either static or in-motion, carbon steel or stainless. AWTX offers stand alone to retrofit existing conveyors or all system components including conveyors to build the needed system for your application. Weigh Leg frames are interchangeable weighing elements that can create a scale out of any conveyor section  either static or in-motion, high grade powder paint finish carbon steel or stainless steel. Avery Weigh-Tronix offers stand alone Weigh Leg frames to retrofit existing conveyors or all system components including conveyors to build the needed system for your application. System components can also be purchased to retrofit existing conveyor installations. Each Weigh Leg frame comes with two Weigh Bars® and a junction box, and a 15' interface cable pre-cornered for easy installation. Each stainless steel Weigh Leg frame comes with two stainless steel Weigh Bars and a NEMA 4 stainless steel junction box, also pre-cornered for easy installation. Conveyors can be created up to 20' in length by using multiple Weigh Leg frames as conveyor supports. When ordering Weigh Legs, please match the overall width of the Weigh Legs to the overall width of the conveyor. Choose any Avery Weigh-Tronix indicator for gravity conveyor applications. For in-motion systems, add a WI-127 or E1310 in-motion indicator and photo eye kit. Note: When selecting a capacity, the weight of the conveyor section must be factored in. 98003-1447 ................ WL18-0250 ..................... 250 lb ........................................... 18"
55359-0019 ................ WL24-0250 ..................... 250 lb ........................................... 24"
55359-0027 ................ WL28-0250 ..................... 250 lb ........................................... 28"
55359-0035 ................ WL30-0250 ..................... 250 lb ........................................... 30"
55359-0043 ................ WL34-0250 ..................... 250 lb ........................................... 34"
55359-0050 ................ WL36-0250 ..................... 250 lb ........................................... 36"
55359-0068 ................ WL40-0250 ..................... 250 lb ........................................... 40"
55359-0076 ................ WL42-0250 ..................... 250 lb ........................................... 42"
55359-1017 ................ WL24-0500 ..................... 500 lb ........................................... 24"
55359-1025 ................ WL28-0500 ..................... 500 lb ........................................... 28"
55359-1033 ................ WL30-0500 ..................... 500 lb ........................................... 30"
55359-1041 ................ WL34-0500 ..................... 500 lb ........................................... 34"
55359-1058 ................ WL36-0500 ..................... 500 lb ........................................... 36"
55359-1066 ................ WL40-0500 ..................... 500 lb ........................................... 40"
55359-1074 ................ WL42-0500 ..................... 500 lb ........................................... 42"
55359-2015 ................ WL24-1000 .................... 1000 lb .......................................... 24"
55359-2023 ................ WL28-1000 .................... 1000 lb .......................................... 28"
55359-2031 ................ WL30-1000 .................... 1000 lb .......................................... 30"
55359-2049 ................ WL34-1000 .................... 1000 lb .......................................... 34"
55359-2056 ................ WL36-1000 .................... 1000 lb .......................................... 36"
55359-2064 ................ WL40-1000 .................... 1000 lb .......................................... 40"
55359-2072 ................ WL42-1000 .................... 1000 lb .......................................... 42"
55309-0010 ................................. 21" ............................................... 24"
55309-0028 ................................. 27" ............................................... 30"
55309-0036 ................................. 33" ............................................... 36"
55310-0017 ................................. 21" ............................................... 24"
55310-0025 ................................. 27" ............................................... 30"
55310-0033 ................................. 33" ............................................... 36"
55359-0217 ................ WLSST24-0250 ................. 250 lb .......................... 24"
55359-0225 ................ WLSST28-0250 ................. 250 lb .......................... 28"
55359-0233 ................ WLSST30-0250 ................. 250 lb .......................... 30"
55359-0241 ................ WLSST34-0250 ................. 250 lb .......................... 34"
55359-0258 ................ WLSST36-0250 ................. 250 lb .......................... 36"
55359-0266 ................ WLSST40-0250 ................. 250 lb .......................... 40"
55359-0274 ................ WLSST42-0250 ................. 250 lb .......................... 42"
55359-1215 ............... WLSST24-0500 ................... 500 lb .......................... 24"
55359-1223 ............... WLSST28-0500 ................... 500 lb .......................... 28"
55359-1231 ............... WLSST30-0500 ................... 500 lb .......................... 30"
55359-1249 ............... WLSST34-0500 ................... 500 lb .......................... 34"
55359-1256 ............... WLSST36-0500 ................... 500 lb .......................... 36"
55359-1264 ............... WLSST40-0500 ................... 500 lb .......................... 40"
55359-1272 ............... WLSST42-0500 ................... 500 lb .......................... 42"
55359-2213 ............... WLSST24-1000 ................... 1000 lb ........................ 24"
55359-2221 ............... WLSST28-1000 ................... 1000 lb ........................ 28"
55359-2239 ............... WLSST30-1000 ................... 1000 lb ........................ 30"
55359-2247 ............... WLSST34-1000 ................... 1000 lb ........................ 34"
55359-2254 ............... WLSST36-1000 ................... 1000 lb ........................ 36"
55359-2262 ............... WLSST40-1000 ................... 1000 lb ........................ 40"
55359-2270 ............... WLSST42-1000 ................... 1000 lb ........................ 42"
Connects two Weigh Legs together for added stability. Recommended if Weigh Legs are not bolted to the floor. Kit includes (2) 2" x 2" x 11 ga. stainless steel tubing with (4) stainless steel clamps and bolts. 55309-1018 ............................. 21" ......................................................... 24"
55309-1034 ............................. 27" ......................................................... 30"
55309-1059 ............................. 33" ......................................................... 36"
55310-1015 .............................. 21" ........................................................ 24"
55310-1031 .............................. 27" ........................................................ 30"
55310-1056 .............................. 33" ........................................................ 36"